Posted in: General Market Thoughts. Tagged: $SPX, DIA, IWM, IYT, QQQ, SPY, XLF. I thought we’d get a huge one day rally on the fiscal cliff news and then we’d roll over for a bit. Not so. Two strong rally days with potentially more to come. I’m thinking that we’ll rally on the hope for a solution and then back off a bit once some solution is announced, but what do I know? Per the RSI on the 60min charts of the Q’s, IWM, SPY, DIA, XLF, & IYT, these sectors are either overbought or very overbought. There are a couple of breadth indicators that I follow that are also overbought. This suggests that we’ll have a little pause in the action tomorrow, though news out of D.C. will definitely trump any and every other thing. We are moving with conviction/volume. Today $SPX did 3.2billion shares, which is 500million more than its average volume of late, and blew by the important swing point of 1438 in the process. When you take out a swing point with this kind of volume action you just have to expect that the market wants to go higher yet. 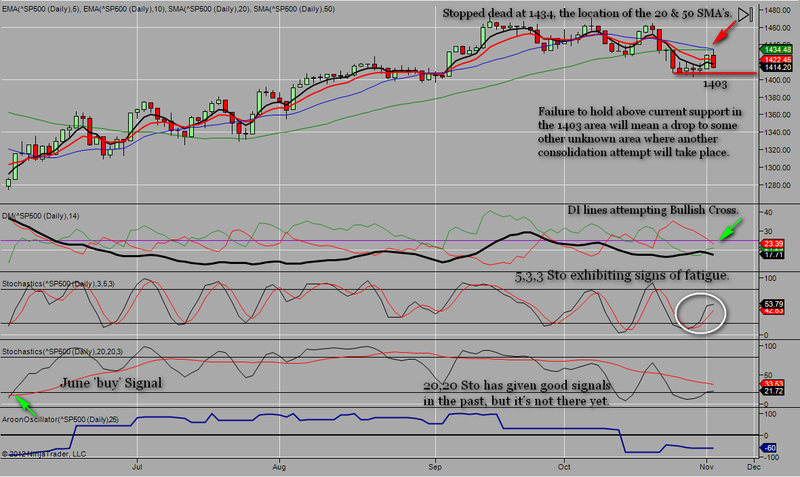 On the chart I’ve put in a price channel and it is pointing right at 1460. Weeks ago I was pretty certain that the $SPX had put in its high for the year but with the way $SPX is moving now it does appear that the previous highs will fall before year end. Time, of course, will tell but that’s the way it looks from where I’m sitting. GL & be careful because only the paranoid survive. Posted in: General Market Thoughts. Tagged: $SPX, DIA, IWM, QQQ, SPY, TQQQ. The fact that the Q’s rallied hard today does not impress me. I have traded QLD for years and have been trading TQQQ since in came out, but I’m not messing around with the Q’s here. All that has to happen is for another AAPL bad hair day and any and all gains that may have been made will just evaporate. I still think AAPL has a long way to go before it bottoms and it’s very possible that I’m totally wrong about this but for now I’m just going to avoid Big Tech in favor of small caps and $SPX. Next, I see nothing in breadth indicators that shows the market to be overbought here. Even the RSI 14 for QQQ, IWM, SPY, & DIA in the 60min time frame backed off from the 70 area going into the close so none of these ETF’s is really showing overbought. But that doesn’t change the fact that today’s candle on the $SPX is very similar to other topping candles that have formed over the last several months. I’ve highlighted all that appear in up moves and you can see that, with one exception, these candle types have marked turning points in the market of one type or another, either pull backs or consolidations. This is a large chart and apparently it’s too large for WordPress. If you click on it, it will open in a new window but even then it’s not that easy to read. I don’t know why the market rallied today. Not a clue. If it was because of the Fed meeting, then what’s newsworthy about that? Everyone already knows what the Fed is going to do: buy more bonds. What’s going to happen tomorrow when this is announced? Rally like it’s 1999? Well, I guess we’ll have to wait and see. Posted in: General Market Thoughts. Tagged: $SPX, SPY, TNA, UPRO. Probably the safest way to play this market now is to use IBD’s rally criteria. Per that criteria, you would wait for a big rally day, like we had this past Thursday, and then look for a follow through day that should come within 3-10 sessions. That follow through day would be a huge rally of close to or exceeding 2% with very strong volume and this would confirm that a new rally is starting. If you don’t get the follow through day, then what you saw was just a dead cat bounce. On Thursday $SPX rallied 1.09% and the day’s low was 1412.20. For the current, potential IBD rally and buy signal to be valid, $SPX can not close below 1412.20 before we get the monster, confirming follow through day. If $SPX should close below 1412.20 on Monday or Tuesday, then the signal is negated and we’ll just have to wait for the next set up. It’s going to be tough to get clear of this level since we’re just 2pts away from that now. The market is currently at a very critical and dangerous juncture and could be setting up a lower high/lower low scenario. The parameters for confirming this are Friday’s intra-day high of 1434.27 and the intra-day low from Friday, October 26th of 1403.28. The Bulls will want to see the market push above 1434.27 sometime early next week and the Bears will want to see the market drop below 1403.28. These only need to be intra-day moves. The market needs to let us know if it has the ability to put in a new high or if it is so weak that it just rolls over and puts in a new low. If the market has the ability to put in a new high then we assume that it also has the ability to put in a new closing high above Thursday’s close of 1427.59 and then more new highs after that. On the other hand, if the market puts in a new low then we have to assume that it will put in a new closing low below the closing low from 10/24 of 1408.75 and then more new lows after that. It’s a guessing game for now but I don’t think we’ll have to guess much past Tuesday or Wednesday of next week. Also, with the election over late Tuesday and with the outcome known, the market may rally on the clarity that that resolution provides. And it probably won’t matter who wins as the market likes certainty over uncertainty every time. But there is one other thing that needs to be watched next week and that is a vote in the Greek Parliament for or against new austerity measures. Pay attention to this issue in the next few days because a failed vote will have negative impacts on Euroville and then the U.S., as well. 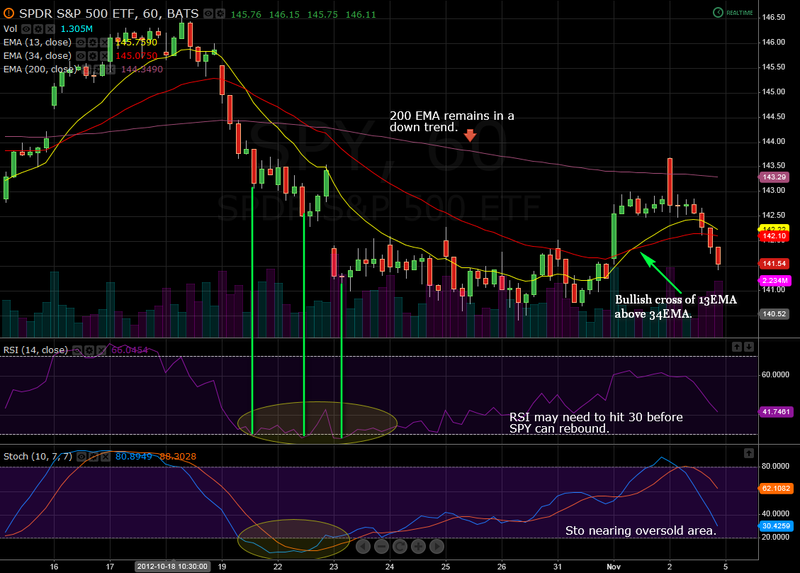 60min chart of SPY showing that the RSI14 has not tagged 30 and suggests that there could be further downside ahead. After getting a Bullish Cross of the 13EMA above the 34EMA on Thursday, the reverse of that is now very close. Bottom line, this is not a happy chart. Click on the charts to open them in a new window. Daily chart of $SPX showing the important and recent support level around 1403. If this level should fail to hold then the next important support level is down around 1397 which would be so close. Problem is that after Friday’s sell off market bias has flipped back to a negative bias and the only thing that would change that would be putting in a new high, as mentioned above. This important 1434 area just happens to be where the 20MA and the 50MA are sitting and if the market can push above them then this would have to be seen as bullish going forward as this would not only mean a higher high for this move but a break above these two key MA’s. This chart is of the 5/10 Method and per this method one gets a ‘buy’ signal when the 5EMA crosses up through the 10EMA, but as you can see on the chart, the black line 5EMA turned south on Friday and pulled away from the 10EMA which is obviously a bearish event. Because my analysis suggested a bounce was in the works, on Friday I added to an existing TNA position and initiated a small position in UPRO. This was before the sell off began so I’m underwater on each of these. I’m going to put a stop under these just below their recent swing lows. Maybe these stops won’t get hit, but if they do then it will mean more and more lows in the days and weeks ahead, IMHO, of course. Even after Friday’s huge reversal of nearly 200 Dow pts and nearly 240 Dow e-mini pts on Friday, Breadth Indicators remain neutral, though near the bottom of the neutral range. Normally after getting readings in this range you would expect some kind of pause or perhaps a bounce in order for indicators to reset, and this is what I’m expecting for Monday. But this is just my guess for now and the markets will certainly let us all know their intention before too long. Be careful. Money in the market is money at risk. And never forget that only the paranoid survive. Back on August 8th & 9th I began to warn of a potential top getting put in in possibly 10 days. At the time, $SPX closed at around 1402. Now, more than 10 days later, with $SPX back to 1402, it does appear that we are witnessing a top in formation. The mad men at the helm can take it all back tomorrow, but if they don’t then I do believe that the decline that lies ahead will not be the garden variety we’ve seen since the June low. I expect this decline to be more like the decline off the March highs into the June lows, but this is pure speculation now, though there is some historical precedent in the $SPX w/$VXO & $SPX w/$VIX charts that I put up a while back. For the moment, I have no ‘sell’ signals in the daily charts, though it’s close using the 5/10 Method. And, with the exception of those unstoppable QQQ’s, the hourly charts of IWM, SPY, DIA all got trashed today and produced sell signals in this time frame, with DIA looking worse than the others. 60min chart of IWM showing fresh sell signal. A quick look at breadth indicators isn’t showing any that have dropped into extreme oversold territory, which is what you would expect given that we’ve only had one day of selling. There’s always tomorrow. If you’re not paranoid, then you’re not paying attention.